Alpha-1-antitrypsin deficiency is a genetic deficiency of the protease inhibitor, alpha-1-antitrypsin, that results in a predisposition to pulmonary emphysema and hepatic cirrhosis. a1-Antitrypsin deficiency is a rare disease that presents primarily in children as liver disease and obstructive pulmonary disease. In adulthood, the disease becomes symptomatic as liver cirrhosis and its complications, including HCC. More than 60 biochemical variants of a1- antitrypsin have been identified to date. The most common types are the protease inhibitor variants (Pi) M, S, and Z. The disease occurs in the homozygous form, PiZZ, and less frequently in the heterozygous form, PiSZ. The probability of a liver disease varies considerably. In adults the PiZZ genotype leads to liver cirrhosis in approximately 15% of patients. Chronic obstructive pulmonary disease is the most common clinical sign of a1- antitrypsin deficiency. Absent or reduced a1-globulins in serum electrophoresis suggest a1-antitrypsin deficiency. Isoelectric focusing is used to differentiate between the various types, which can also be defined by molecular techniques. • Felt to be under recognized. • Affects approximately 80,000-100,000 Americans (including symptomatic and asymptomatic). • Accounts for approximately 2% of COPD cases in Americans. • One in 10 individuals of European descent carry one of two mutations that may result in partial alpha-1-antitrypsin deficiency. • Physical findings and clinical presentation are varied and dependent upon phenotype. • Most often affects the lungs but can also involve liver and skin. • Classically associated with early onset, severe, lower-lobe predominant emphysema; bronchiectasis may also be seen. • Symptoms are similar to “typical” COPD presentation (dyspnea, cough, sputum production). 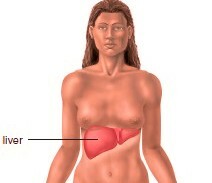 • Liver involvement includes neonatal hepatitis, cirrhosis in children and adults and primary carcinoma of the liver. • Panniculitis is the major dermatologic manifestation. The majority of patients with clinical disease are homozygotes with a PiZZ phenotype. Some may present in childhood and a few require transplantation. Approximately 10-15% of adult patients will develop cirrhosis, usually over the age of 50 years, and 75% will have respiratory problems. • Development of emphysema is believed to be a result from an imbalance between the proteolytic enzyme, elastase, produced by neutrophils, and alpha-1-antitrypsin which normally protects lung elastin by inhibiting elastase. • Deficiency of alpha-1-antitrypsin increases risk of early-onset emphysema but not all alpha-1-antitrypsin deficient individuals will develop lung disease. • Smoking increases risk and accelerates onset of COPD. • Liver disease is caused by pathologic accumulation of alpha-1-antitrypsin in hepatocytes. • Similar to lung disease, skin involvement is thought to be secondary to unopposed proteolysis in skin. • Suspicion for alpha-1-antitrypsin deficiency usually results from emphysema developing at an early age and with basilar predominance of disease. • Suspicion for alpha-1-antitrypsin deficiency resulting in liver disease or skin involvement may arise when other more common etiologies are excluded. • Serum level of alpha-1-antitrypsin is decreased or not detected in lung disease. • Investigate possibility of abnormal alleles with genotyping. • Pulmonary function testing is generally consistent with “typical” COPD. • Chest x-ray examination shows characteristic emphysematous changes at lung bases. • High resolution chest CT usually confirms the lower lobe predominant emphysema and may also show significant bronchiectasis. • Avoidance of smoking is paramount. • Avoidance of other environmental and occupational exposures that may increase risk of COPD. • Acute exacerbations of COPD secondary to alpha-1-antitrypsin deficiency are treated in a similar fashion to “typical” COPD exacerbations. • The goal of treatment in alpha-1-antitrypsin deficiency is to increase serum alpha-1-antitrypsin levels above a minimum, “protective” threshold. • Although there are several therapeutic options under investigation, IV administration of pooled human alpha-1-antitrypsin is currently the only approved method to raise serum alpha-1-antitrypsin levels. • Organ transplantation for patients with end-stage lung or liver disease is also an option. • Prognosis of patients with alpha-1-antitrypsin deficiency will depend on phenotype and level of deficiency. • Pulmonary and hepatology referrals for advanced lung and liver disease, or if replacement therapy is contemplated (e.g., moderate-severe lung disease). • Lung and liver transplantation in suitable cases. • The liver damage arising from the mutation is not from a deficiency in alpha-1-antitrypsin but from a pathologic accumulation of alpha-1-antitrypsin in hepatocytes. • Consider alpha-1-antitrypsin deficiency in patients presenting with lower lobe predominant emphysema; in most smokers without alpha-1-antitrypsin deficiency emphysema predominates in the upper lobes. Approximately 5% of patients die of their liver disease. Heterozygotes (e.g. PiSZ or PiMZ) may develop liver disease, but the risk is small. • Degree of alpha-1-antitrypsin deficiency is dependent on phenotype. • “MM” represents the normal genotype and is associated with alpha-1-antitrypsin levels in the normal range. • Mutation most commonly associated with emphysema is Z, with homozygote (ZZ) resulting in approximately 85% deficit in plasma alpha-1-antitrypsin concentrations.